Dear Ones: This week over at I heart Faces the challenge is Halloween Dress up. 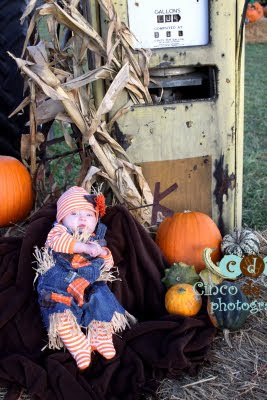 Just last week I had a photo shoot with an adorable little one who was the cutest scarecrow ever. Leave me a comment and let me know what you think then head on over to I heart Faces to check out the other entries. Oh my word. She is a sweet little scarecrow! What a good idea for a costume! Very clever! Lovely! What an adorable little one, so cute! Quite the set up for a photo shoot. Very cute baby in that outfit! How sweet is that!?! Love it. cute photo, I LOVE that costume. Oh very cute! I love this photo. She is so adorable!!! Nice setup! Oh, that is the cutest costume! What a fun setting, too.